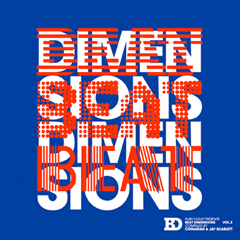 Beat Dimensions is back with the second in the series, again defying the abstract universe of hip hop. Three years ago, two talented DJ/producers Cinnaman & Jay Scarlett compiled an album named Beat Dimensions and they have changed the abstract districts of hip hop and beats. This album was handled as the reference point, origin of futurist hip hop and beat culture. It also gathered international beat makers from all around the world into a single compilation. Now Beat Dimensions is a very cool brand representing all futurist and innovative thoughts in beats and abstract hip hop culture. The new compilation is available as CD, 12" and 7" set and as usual digitally. Containing the best and upcoming producers such as Danny Breaks, Dorian Concept, Dimlite, Ras G, Samiyam, Dizz1, Low Limit & Tiago Beat Dimensions again dictated the conventions and current manifestations of contemporary hip hop scene. Lend an eye and listen to it deep, you won't be disappointed. If there are any more interesting things than dub step in the beats cosmos, you will find them in Beat Dimensions!